For some time I have been trying myself to follow more useful content on the web and I realised how difficult and time consuming this is. I’ve been coming to terms by degrees with my personal FB account. I know, I am a blogger, since this is a blog, but still I am not all so comfortable writing stuff unknown people will read – go figure… Fortunately, thanks to all the comments you have left here, I now have the pleasant feeling I somehow know who I’m writing for. So I decided to reach out more and set up this FB page for any potential reader who might follow the blog easier via social plugins than via blog feeds and feel more comfortable leaving comments there. Though I hope to keep the comments here as this might be more helpful for everybody. I’m not still sure how well this will work, guess I’ll just give it a try. I also have a tweeter account and I’ll try to activate that too.. so all web will resonate of all my chirps! And since I am talking about web life, the other two places I try to participate with comments in are – of course blenderartists and cgarchitect.com. Blenderartists is the Blender place, and a lot of good architectural visualisations have been posted there lately, but Cgarchitect is where I can check myself against a lot of max-vray tough archviz. That’s why I need your encouragement – every time I open that page I sigh, then decide I’ll try harder! I am also following Maria (when we are not directly sharing stuff over Skype) and I had started following Ray’s blog too only he closed it so he could have more time to post comments here! I silently follow other blogs too, Blender related, architecture related and art related not to mention kid related… and it’s getting more and more complicated as so much interesting stuff goes around like crazy every day. I hope we’ll all be keeping our sanity….and a social life, a real one. Only thing left.. how do I get the linky FB thing on this wordpress page..? well, if you see it somewhere around it means I’ve found it! 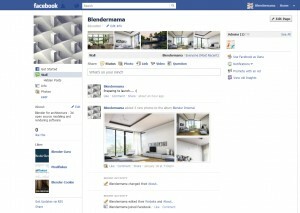 I went right over to facebook and “liked” Blendermama! I really don’t know how you find time for it all, but I wish you luck. 🙂 Well, I hope it won’t be much trouble after the initial setup.. I’ll soon find out..
To be honest, the deeper I get into Blender, the less time I have for anything else. I’m pursuing photorealism, and you know how difficult that is. Hi Ray! You have doubled the blog value at least 🙂 It’s true, the comments section is often the most interesting part of any website. I’m fighting with time myself so I fully understand, and Facebook is a terrible time trap, good thing you manage to stay away. I try making a rule to just check it once in the morning over coffee but you bet after putting those FB pages up I was going there all day to see how’s it working! Novelty starting to wear off, luckily for my next deadline. I admire your work,sharing and passion for Blender. I wish that there were more sites,excellent like yours,so that it can help others like me,to come over this barrier. Each time i use Skechup for modeling i think to myself that it could be done in Blender,and so from time to time,i am exercising it. I would like to ask you if you ever found an interior design tutorial,that goes fully from the beginning to the end…? Thanks again for your beautiful sharing works. Some years ago when I was starting to use Blender there was a video tutorial that helped me a lot, but I’m afraid it must be a bit outdated, and I don’t use that method for building walls anymore, I make a shell and apply the solidify modifier. It is still here though the author doesen’t seem to have a website anymore. There are some good tutorials at Blender Guru and a book by Allan Brito (that’s a bit outdated too and doesen’t cover all, for instance he dismisses rendering interiors with BI). Yorik’s site is useful too. But you probably know these websites already. If i find some other good resources I will post about them. My next try at modeling tutorials will happen after I get familiar with B-mesh, as I belive it will improve things greatly. Thanks for your detailed answer.I’m familiar with those links that you mentioned,but still looking for more detailed tutorial like it exist in other softwares. The Blender users community on the web,is so amazing.It’s one of the reasons that convinced me to stay,and give up on switching to other softwares like Rhino or Modo. I manage to produce nice interior visualization with skechup&podium,but the challenge of doing it entirely with Blender is my main motivation.